Cheri Klussendorf, Integrated Solutions Coordinator at Riesterer & Schnell, is responsible for pulling all information from Integration Solutions Consultants and making sure it gets billed to the correct client each day. Cheri discusses tracking time, giving customers value, and promoting service plans. How does Riesterer & Schnell track time? Tracking time is a huge challenge for any dealership, according to Cheri. Integrated Solutions Consultants may only track ten to fifteen hours per week instead of their full forty hours. When Consultants are busy throughout the day and don't keep track of where they're spending time as it happens, they end up pushing it to the end of the week. At the end of the week, it's difficult to recall what was done earlier in the week, so time gets missed and not all time is tracked. "We were missing a lot of time that should have gotten billed to customers," says Cheri. "We found AgriSync and decided this would help us because tickets are created immediately and would help us track that a little bit better for our internal usage." How does AgriSync benefit customers? "They've been really happy," says Cheri. "A lot of them are really excited that they're going to to get a quick answer." Before AgriSync, one of the biggest challenges to answering customer phone calls was the availability of techs. If techs were busy helping another customer, the call would just go to their voicemail and the tech would call the customer back eventually. 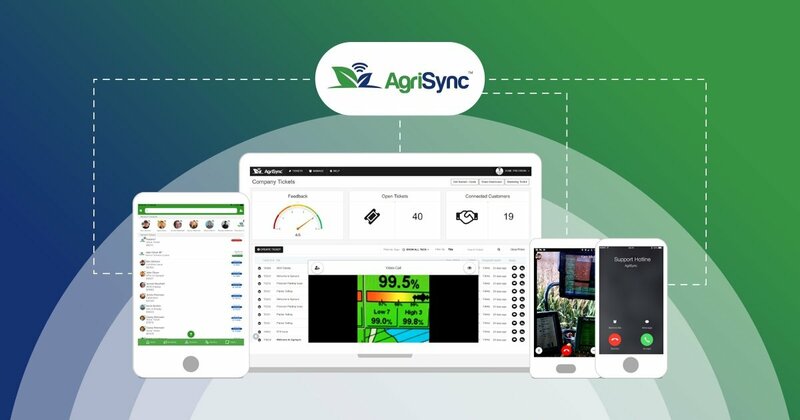 With AgriSync, all members of the service team are alerted simultaneously, so there's usually an answer by the second ring for all customers. Once in while, a customer will be sent to voicemail but gets called back within 15 minutes. Riesterer & Schnell is able to not only provide value to customers; but also let those customers know their time is just as valuable. What is it like to work with the AgriSync team? "AgriSync's been really helpful. Anything that I've asked for, they've been really good with making sure it happens or getting it in the planning stages of coming true for us." How should dealers promote service plans? When discussing ways to promote service plans, Cheri suggests to "Just get it out there as much as you can. We use our newsletter a lot." Cheri says, "We've also done the window clings on the tractors and then been able to go out and put those on the tractors for the customers. A lot of our problem was that customers would get the window cling and not put it on, so we've taken the initial step to go out and put it on. We've had huge responses because the phone number is always there." 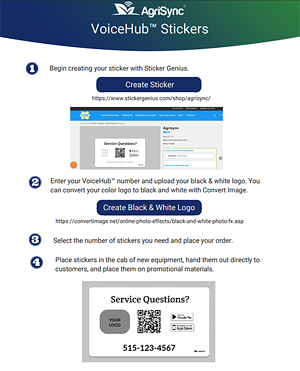 The AgriSync team put together some templated resources for stickers, postcards, business cards that you can quickly grab and customize in PowerPoint. Just add your logo and VoiceHub number. Get the templates here.